The Swayambhunah Temple in Buddhist Tradition is second only to Boudhanath. It occupies a postion on top of a hill with splendid views of both the City below and surrounding hills. Centre piece and at the very top of the Hill is the large Stupa which is surrounded by Prayer Drums then smaller Shrines all attended by both local people and Pilgrims from afar. Around almost every corner you will find Monkeys, they climb and leap every where, special fun is watching them ascend the Shrines and Stupas using the Prayer Flags! As with all places in Kathmandu you will see stray dogs but neither them or the Monkeys seem to bother each other. Some local folk call it the Monkey House! There are various ways of getting to the Temple, you can be dropped off at the bottom of the hill and walk a few hundred steps up or get a Taxi straight to the top which only leaves a minmum of steps to climb. Around the Stupa itself there are numerous Shops selling everything from the usual Souvenir type products to Craft work made in front of you. Just inside the entrance from the top of the Hill you see the Staff Quarters. Be there at the right time and you'll see the Monkeys being fed. This is rather amusing to say the least, they are not exactly polite to each other. 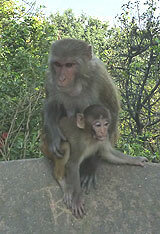 One tip is that should you see a Mother with it's Baby stay well clear, they are very protective of their young ones. Get too close and you'll be attacked. I even saw a Worker there giving a Mum and Son a wide berth as he was fixing up some Prayer Flags. It's a beautiful place in a beautiful setting, the amount of Prayer Flags amongst the slopes take your breath away. The other tip is to try and get there early before all the Coach Parties of other Tourists arrive and you see the full colour of the Worshippers and Pilgrims.